During the one week spring break (March 30-April 8, 2017) we decided to go battle the crowds and travel to visit the national park of Zhangjiajie, the small rivertown Fenghuang and the famous karsts of Guilin. ZJJ and Guilin are two of the most popular tourist sites in China so we were prepared to fight the mobs. We booked Airbnbs in all three places except instead of staying in Guilin we stayed in Yangshuo. We flew from Shanghai to ZJJ and back from Guilin and took a bus from ZJJ to Fenghuang and then from Fenghuang to Guilin. A word about arranging travel in China. I booked almost all of our trips using CTrip which worked out great. They send you an email with a ticket number after you book the ticket and the number is used to retrieve your ticket from the train station or airport. It might be a little more expensive than what the local Chinese pay but the convenience was worth it. The huge throngs of tourists and large tour groups can make traveling to popular sites in China very off-putting. Adding to the problem is that Chinese tourists have replaced the ugly Americans as the most obnoxious in the world with their disregard for rules and common courtesy. Unfortunately many people who visit China come back with negative impressions of the country. I often found myself scolding people for cutting into line or littering or ignoring the signs to stay off the grass. As an older person, most people were apologetic when I scolded them, but it’s not fun to be a policemen on your vacation and, of course, it’s not going to change the behavior of 1 billion people. In the end, one just has to put up with the crowds and the behavior. If you have not traveled to popular tourist spots in China, you should be aware that these spots are invariably extremely crowded, especially on weekends and national holidays. So you should do your best to avoid those dates if possible. Our photos do not capture the extent of the crowds because I made considerable effort to try to avoid getting the mayhem into the pictures. For many spots where there is a particularly nice view, you have to queue in line as people take turns getting their selfie. And there are many large Chinese tour groups that roam the parks with loud megaphones blaring irritating messages. The government also exacerbates the problem: at a particularly scenic spot at the Great Wall, there is a loud and constant message on a loop saying what you are not allowed to bring onto the Wall (firearms, explosives, cannons, duh!!) that provides a terrible backdrop to the view. You just have to learn to get used to the mayhem and not let it detract from the magnificent scenery around you. I think the native Chinese are just so used to the constant loud blather in their lives that they don’t even notice it. 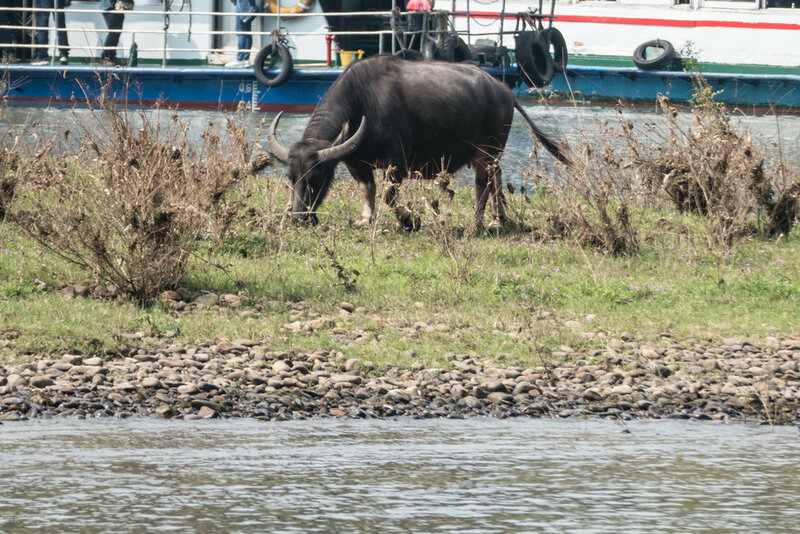 Compared to National Parks in the USA, one of the striking differences is that in China we saw virtually no wild animals with the exception of wild monkeys. There were none of the common wild animals and no raptors one would see routinely in the wild areas in the USA, no deer, elk, bears, eagles, or hawks. Of course we were not camping and the crowds were much larger, even in comparison to Yellowstone or Yosemite. When we did see the occasional squirrel or chipmunk, the crowds went wild, gathering around to try to get a photo of them. This probably reflects the fact that people have been in the parks in China for over a thousand years and eventually we drive the animals away or extinct. In the US, it’s likely that our wild areas will be similarly devoid of wildlife in a few hundred years. Not a pleasant thought. 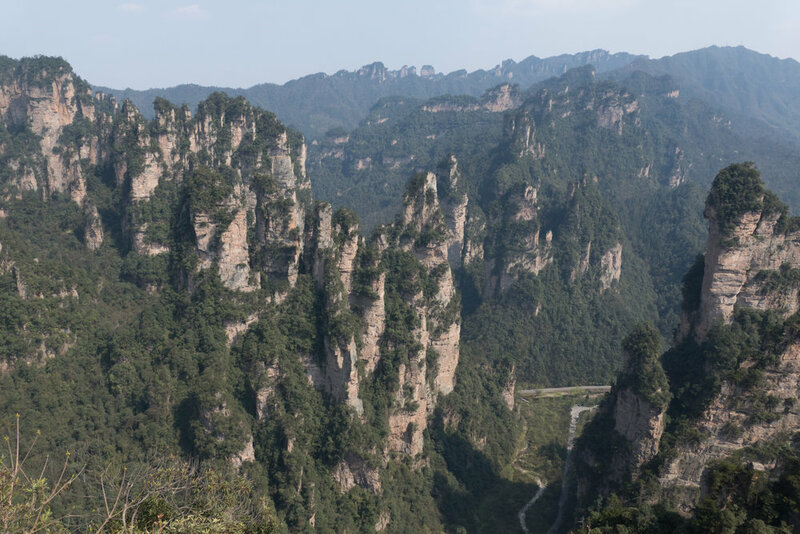 Zhangjiajie (ZJJ) has two fantastic national parks about an hour apart. So in visiting ZJJ you can either stay in the town of ZJJ, which gives you access to the nearby Tianmenshan park, or do as we did which was to stay in Wulingyuan, which is close to the ZJJ national park. These options are about an hour’s taxi ride apart so not a trivial distance. Our Airbnb host offered to come meet us at the airport and take us to his Airbnb for a small price. He was also very helpful in arranging an English speaking guide to take us through ZJJ national park and Tianmenshan. The first day we visited ZJJ national park in Wulingyuan. In 1982 ZJJ was designated as the first of the country’s national forest parks and in 1992 was made a UNESCO World Heritage Park. This park has spectacular pillars that arise from the valley floor. The park reminds me of Bryce Canyon’s hoodoos, except these are rocky and tree covered. Apparently these were the inspiration for the Hallelujah Mtn in the movie Avatar Here a guide is helpful because the park is sprawling with buses to ferry you from one site to another. So some knowledge of what to see and how to get there is helpful. Our guide Summer was also helpful for avoiding some ticket lines. All in all she was great so I got her phone number and promised that we’d steer some customers her way. Email me if you wish to get her contact information. The following day, Sunday, we tackled Tianmenshan. We did not know (i.e. 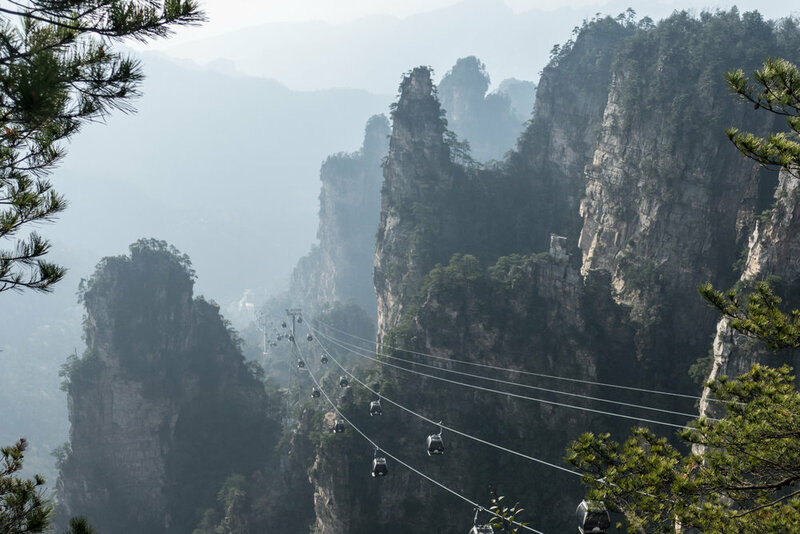 our guide books had not warned us) that getting a cable car ticket to Tianmenshan, which is the only way up the mountain, is a major hassle. Fortunately our guide lived in ZJJ so she got up early in the morning to stand in line. But the tickets specify when you can enter the park. She got tickets for which we had to enter before 9 AM but we had to get there from Wulingyuan. On the ride Summer and the driver were phoning and texting because we were a bit late. In the end we were fine though we did run for the gate to make the deadline. 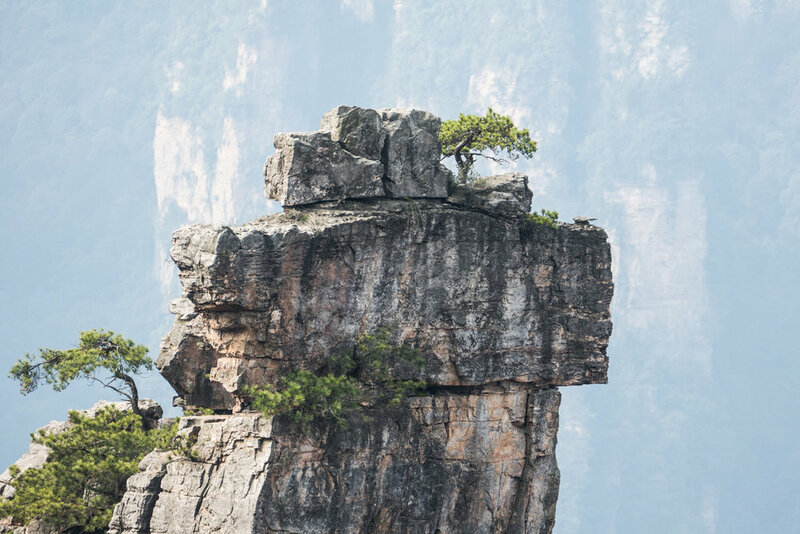 Tianmenshan means Heaven’s Gate Mountain and is named for a natural spectacular opening in the mountain that is large enough to fly small airplanes through it. People have also glided through it in wingsuits and the world championship wingsuit competition has been held here. As you might guess, there have also been fatalities from people trying to fly through the arch. When we were there, the famous 999 steps leading to the gate were closed (which provided a nice excuse not to climb it! ), perhaps because they had been damaged by a commercial that had been filmed a month earlier of a 4 WD range rover driving up the 45 degree incline. The commercial was aired widely during the World Cup. The crowds were pretty bad on Tianmenshan though the views are spectacular too. They have a couple of famous cliffwalks where you are hanging high above a cliff, in two cases on glass bottom cliff walks. Not for those who don’t like heights! Another benefit of having Summer was that she knew the good places to eat on the mountain and also after we got down in the afternoon we went to a really nice traditional Hunan restaurant where they cook the food at your table. The table itself is actually on top of a wood burning stove with an exhaust fan system. Lil and Summer on the glass cliff walk. Note the red rubber slippers that one has to wear on the walk to minimize scratching the glass. View of the Heaven’s gate from the usual access point. Unfortunately the steps were under reconstruction so we were not allowed to climb the 999 steps to the top. 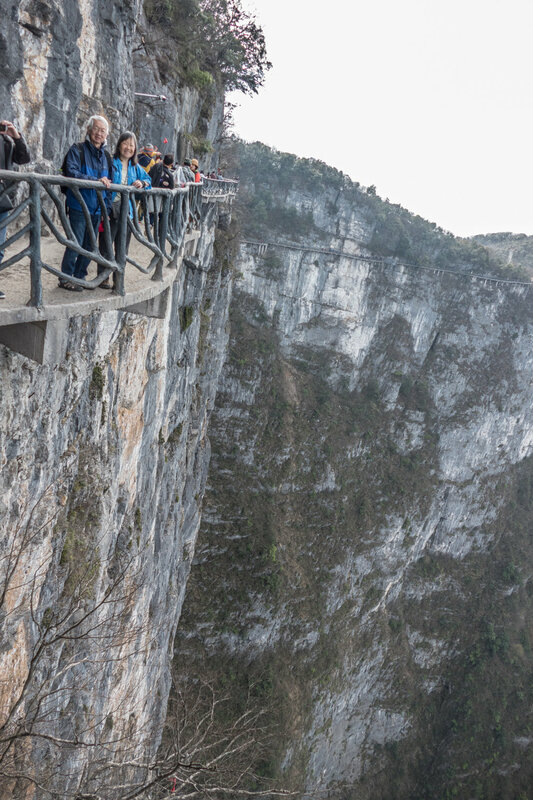 During the World Cup there was a popular commercial for a 4 WD vehicle that showed it climbing the steps of Tianmen so that might have been the reason for the need for repair. Preparing lunch at an old Hunan restaurant. The following day we went to ZJJ national park by ourselves to do the Golden Whip Stream and 10 mile ride. This was on a Monday so the crowds were down and the hike along the stream was much more peaceful than on the mountains in the previous days. 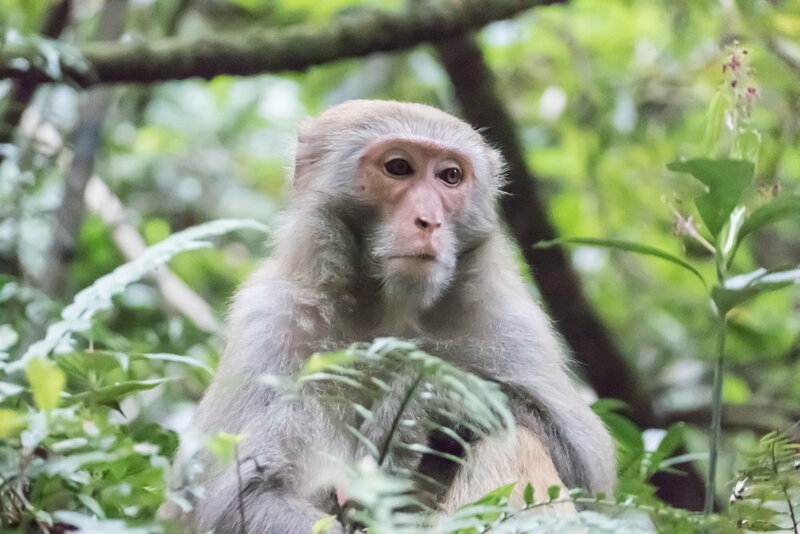 Quite a few wild rhesus monkeys were along the way, looking for handouts. Our Airbnb host at ZJJ was a very nice and smart fellow. He grew up in ZJJ as a member of the local minority group. When booking the Airbnb places, I usually had a couple back and forth exchanges with the hosts to ask questions about the place, arrange for pick up or instructions to the property. If we communicated in English, it was usually obvious which ones didn’t really speak English but were merely writing in Chinese and having it translated. The host in ZJJ had very good English so I expected that he spoke English and was surprised when I met him that he didn’t. When I complimented him on the English in his emails, he told me a clever trick. He would write the message in Chinese, have it translated into English, and then type the English in to have it translated back to Chinese. He said he would do this a couple times until the Chinese came back the way he wanted. Maybe Google translate could learn something from this. The following day was spent mainly on a bus, a 5 hour ride from ZJJ to Fenghuang through the mountains of Hunan. Fenghuang is a picturesque ancient village centered around the Tuojiang river and a UNESCO World Heritage Site with over 300 years of history. The area has a heavy ethnic minority presence from the Miao and Tujia minorities. During the day many many older minority women try to induce tourists to dress up in the colorful minority costumes to take pictures. Then at night the town comes alive as all of the shops and houses along the river light up and a lively and loud nightlife of bars and clubs that stay open until the late hours. In Shanghai we live very close to a street that was called the ‘bar street’ because a few years ago it suddenly became a popular hangout, which I imagine is like the bars in Fenghuang. However, the locals in Shanghai soon tired of the noise and chaos late into the night and successfully closed down all of the bars. In Fenghuang, however, the town survives on tourism so the locals put up with the noise and music. The town has about 10 ancient residences that have been preserved and maintained as tourist sites. Some of them feature dancing, singing or other entertainment. The most famous local resident was one of China’s most famous authors Shen Congwen. It’s said that he was selected to win the 1988 Nobel Prize in Literature but unfortunately died before it could be awarded. His most well-known book is ‘Bordertown’ which is about his home town and a show is presented nightly in Fenghuang. In the late 1930s he taught at the Associated Southwest University in Kunming, Yunnan which was a school in far southwest China comprised of three of the best universities in China amalgamated into one school because of the Japanese invasion of the north. My parents attended this school and my mother still remembered that Shen Congwen taught Chinese literature then. Dueling exercise groups in the central square of Fenghuang. It is not unusual to see such exercise groups in parks in China but it is uncommon to see two of them competing for the loudest music. On our last day in Fenghuang we hired a car/guide to take us to a nearby ethnic village. 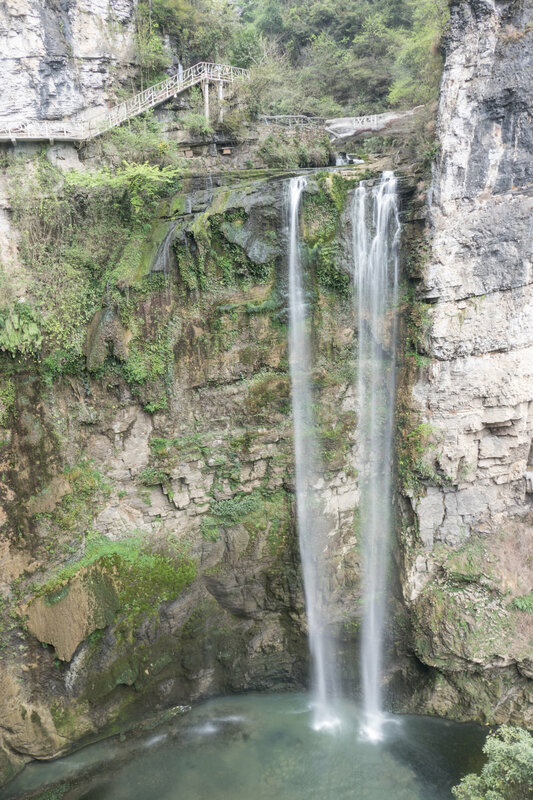 We were hoping to see what village life was like and to experience ‘old China’ in a small village, but instead the visit was chiefly a lovely hike along the mountains leading to a high waterfall. We did get some views of village life and our guide also talked about his experiences growing up in such a village. The surrounding mountains are jungle-like and he said that there was so little to eat when he was growing up that the kids would go out into the woods and scavenge for edible fruits and vegetables while trying to avoid the snakes underfoot. Driving a car is apparently more profitable. Feitian (flying sky) waterfall. It is about 100 m drop based on timing the drop and Newton’s laws. When we left Fenghuang to take the bus to Guilin, our Airbnb host was worried that we wouldn’t be able to find the bus station and get the right bus to Guilin because he worked during the day and would not be able to take us to the station. Apparently there’s more than one bus station in the small town. So he told his wife to go with us out onto the main street to hail a taxi, and tell the taxicab driver where to take us. Then after we got to the bus station as we were sitting on the bus waiting for it to depart, a man suddenly came onto the bus , walked down the aisle until he was next to me and asked us if we were going to Guilin. Our host had called the bus station where he had a friend who came to check that we made it onto the right bus. Now, that’s over the top service! We spent two nights in Fenghuang and then took a bus to Guilin which ended up as a 7+ hour ride. We had made reservations to stay in Yangshuo rather than Guilin on the advice of some travel blogs that I read in Photo.net. So to get to Yangshuo from Guilin required going to a different bus station and riding for another hour. The description of the classic thing to do in Guilin is invariably to ride the boat (4-5 hours) on the Li River from Guilin to Yangshuo. So as we are riding the taxi to the other bus station we started contemplating whether it made sense to go to Yangshuo that night and then have to return early in the morning for the boat ride. Our taxi driver agreed that didn’t make sense and he could get us tickets for the boat ride that night and also a hotel room for the night. So in the cab we decided to change plans and stay in Guilin – this was a major mistake!! The cruise that he took us to was not a trip down the Li River from Guilin to Yangshuo, but as it turned out next day we discovered it was a bus tour with two short boat rides on the Li River with major diversions along the way, such as a 2 hour stop at a jade store to try to get you to buy jade along with a 1 hour tour of Guilin to pick up the other 50 riders at their hotels. Essentially they lied to us and made it sound like a boat ride. For example, several times I inquired about what would happen to our luggage when we are on the boat. They said that they had a special bus that would take the luggage to Yangshuo where we would pick it up. In fact, we and the luggage were on the same bus all along so there was no worry about the luggage leaving us. Many of the other Chinese travelers were also really upset about the itinerary (of course, no mention of the stop at the jade store when we bought the tickets) but once you were on the bus, there was nothing to do but go along. Oh well, if that’s the worst scam we get roped into in China it was worth it. Unfortunately it seems like such scams are ever present in this new ‘free enterprise’ economy. Mao should be turning over in his grave. It was partly because we had such positive experiences with our Airbnb hosts in Fenghuang that I wasn’t that suspicious of our taxicab driver in Guilin who talked us into the ill-founded change of plans. And he seemed like a nice guy and wasn’t pushy at all, just offering another alternative. 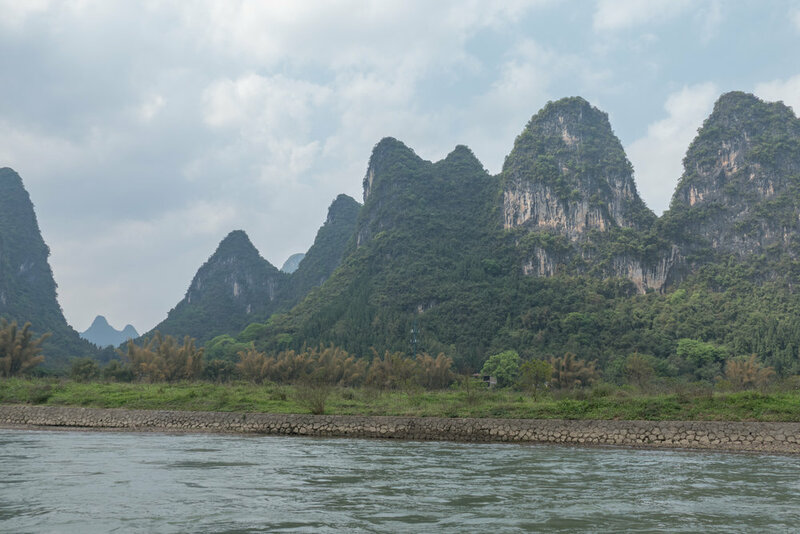 The short boat rides on the Li River were scenic but packed with other tour boats, each trying to get the best view. The trip ended with a bus ride down to Yangshuo but before going to the city we visited a very small ancient 500 year-old ethnic village called Longtan. The flotilla of tour boats on the Li River. At the most scenic parts of the trip, there’s a mob of tour boats jockeying to get the front position. Not the most relaxed trip down the river. Karsts with tour boats on the Li River. Our stay in Yangshuo after the disaster in Guilin was great. The Airbnb was in a small village called JiMa on the outskirts of the city and it had a nice view of the karsts (hills) for which the area is famous. The highlight was a trip on two-man-with-a-pole bamboo raft down the Yulong River which is not quite as famous as the Li but is much more attractive because it has only a few percent of the tourists. The boat rides on the Li River the day before had the worst aspects of touring China, overcrowded bustling boats jostling with tourists to get to the best view while a flotilla of other boats on the river do their best to spoil the view. On the rafts at Yangshuo, there were only a few other boats and the main worry was whether the raft would make it over the 7 or 8 small dams along the way without overturning. We were visiting during the Qinming Festival which is the days when one is supposed to ‘sweep the tombs’ of ones ancestors, i.e. clear the tombs of the year’s growth. Then it is traditional to set off firecrackers on the tomb to let the ancestors know you have not forgotten them, and the louder the better. Our Airbnb was in a small town Jinma near Yangshou and one could hear firecrackers going off all day. At each of our 3 stays (ZJJ, Fenghuang and Yangshuo) we went to a big show that was put on every night for the tourists. They were all set in large outdoor amphitheaters and were uniformly impressive, well done and not that expensive. All of them put a big emphasis on the ethnic minority groups in the area which is a bit surprising given the official government attitude toward the ethnic minorities is often not that positive, e.g. how they treat the Tibetan Uighers. The one in ZJJ was a variety show with singing, dancing, amazing acrobatics, knife throwing, etc. It had a few audience participation bits where volunteers from the audience came up to join the fun, in one case to hold a balloon while a knife thrower popped it. The astounding act for the knife thrower was when his assistant, a lovely girl of course, was strapped onto a rotating disk with her arms and legs out and he threw knifes between the appendages while the disk was spun at high speed. Yikes! The other two shows had story lines that we couldn’t follow very well but were nonetheless enjoyable. In Fenghuang the show was labeled ‘Border Town’ after a famous novel by the most famous personage in the town, Shen Congwen, who taught at the university that my dad and mom attended during the war. The story is about a young orphaned girl and her grandfather who is a ferryman in the river town. In Yangshuo the story was “Liu Sanjie” (three Liu sisters), directed by Zhang Yimou which was apparently a well-known story and popular movie.